There are many architectural marvels in #IncredibleIndia. Taj Mahal is one of them. I still can’t get over the first sight of that monument. It had mesmerized me. On my recent trip to Rajasthan, I saw some astounding forts and monuments. 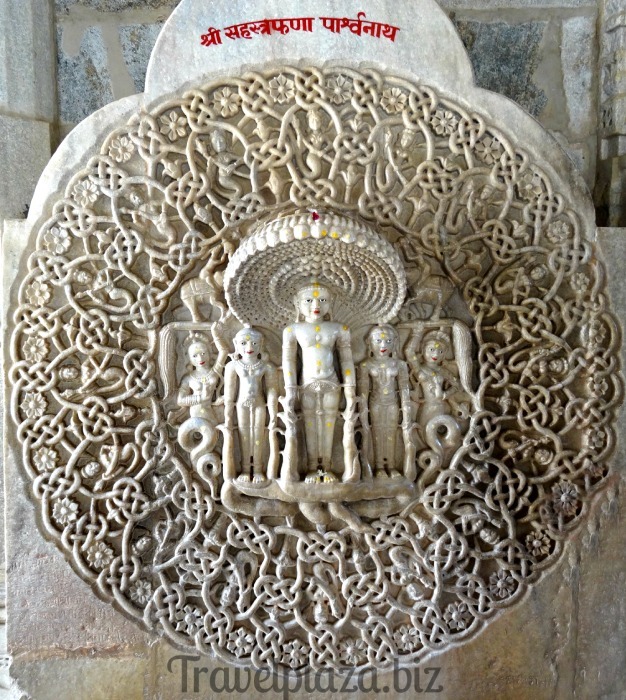 But the Jain Temples at Ranakpur as we were enroute to Udaipur were among the most spectacular that I have seen. Made from marble and dedicated to the first Tirthankar and founder of Jainism, Adinath, the temple is an architectural marvel. As you set foot in its cool confines shading yourself from the heat in the area, you are bound to do a double take. 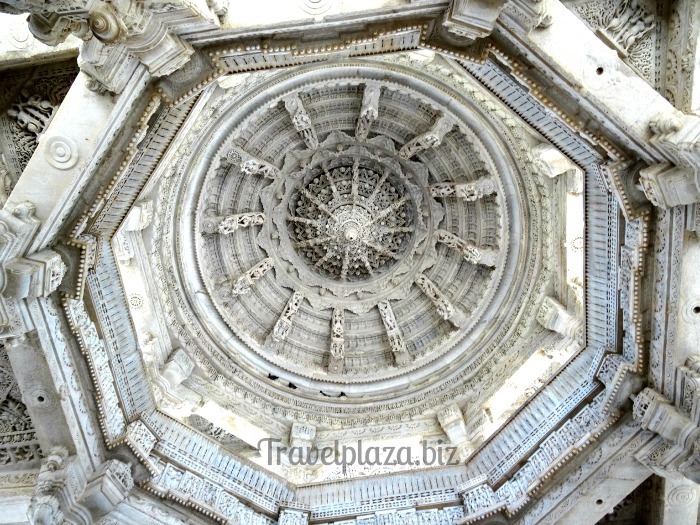 The temple is perched on 1444 pillars, perfectly symmetrical and astoundingly carved. It is said that the carving on no two pillars is the same. As the husband and I walked in, we saw the place milling with foreigners who were sitting about just taking in the beauty of the place. The priests, one of them took us on a small tour, allowed us to go into the main sanctum and pray to the deity. Apparently, only Indians are permitted to do so now. The priest who says has been in the temple since generations spoke fluent Hindi and English and told us a bit about the temple and its history. There is a very old banyan tree inside the temple which has a root in the shape of Ganesha. There are two bells in the sanctum which toll twice a day only at prayer time. 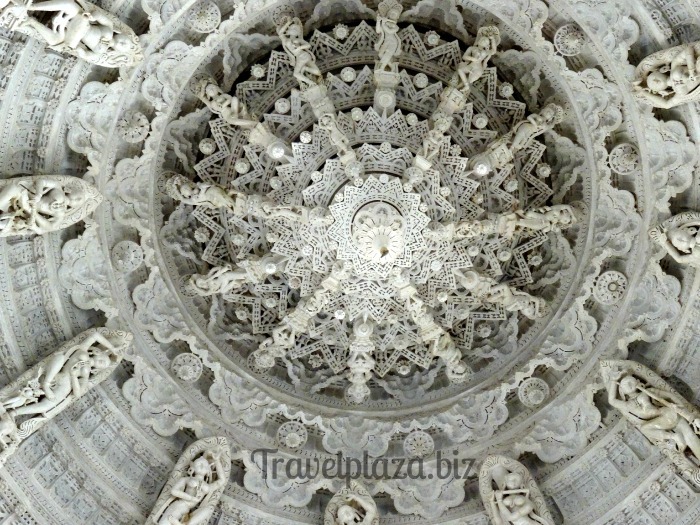 Their sound echoes in the Aravalis and they echo the sound of “Om.” The ceilings are ornately carved and the symmetry will just leave you with a gaping mouth. 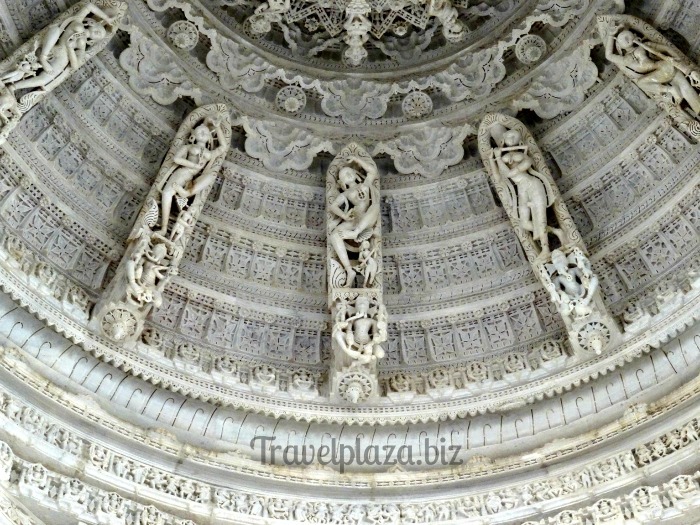 We were told that the intricate carving on the ceilings and pillars has inspired prints on apparel and handicrafts. 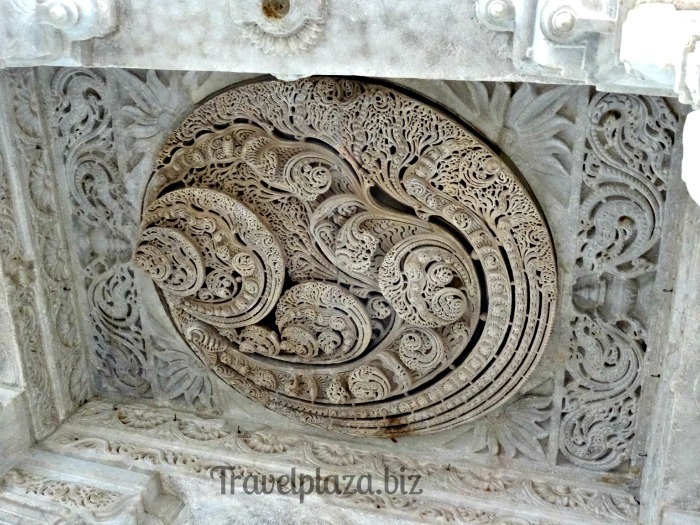 There are elaborately carved elephants at the entrance and other locations. The eyes of the Tirthankar glitter in the light and seem to be looking at you from every angle. You can sit around in this quiet temple for hours and revel in the peace. 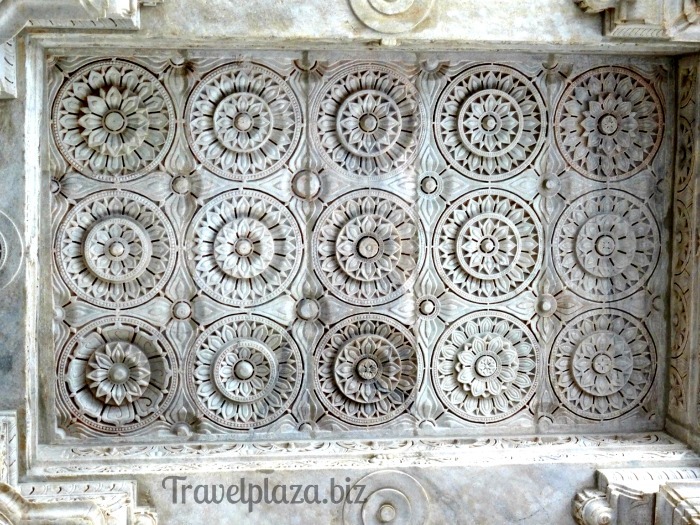 I also found many Hindu elements in the architecture including Hindu gods and goddesses carved in the ceilings and pillars. Even the temple is built just like the Hindu style of temples. Such amazing harmony of architectural styles and religions. 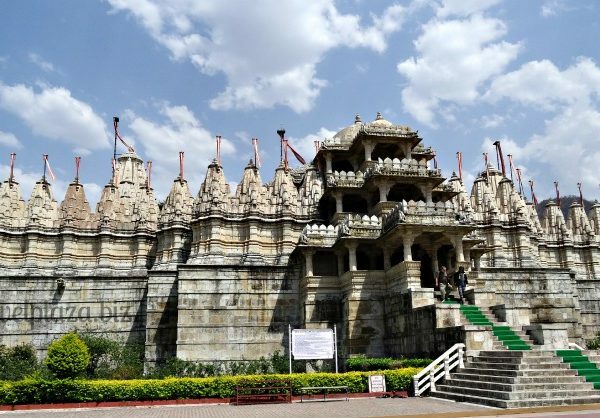 You are sure to be stunned by the exquisite beauty of this temple that was started in the 15th century by Dhanna Shah. It is named after the ruler of Mewar, Rana Kumbha, under whose patronage the temple was completed. 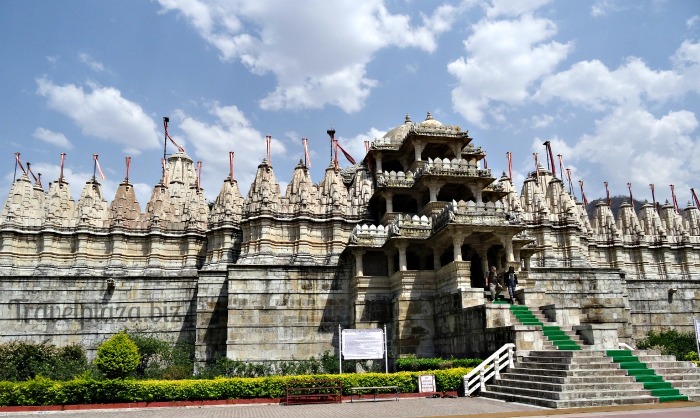 Situated on a steep slope of a hill, this is an imposing temple and a must visit when you go to Udaipur in Rajasthan.